Margaret has captured a profile of this majestic Australian native frog, the green and golden bell frog. Its taxonomic or scientific name is Litoria aurea. 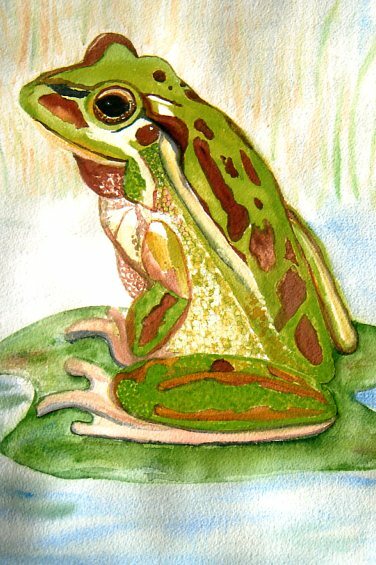 Litoria is a genus of frog in the region of Australia and the south pacific. Its latin meaning is green. Many green frogs are in this genus, but this frog, aurea simply means gold. It is a frog that is normally averaging a length of 6 to 8 centimetre, making it a relatively large frog in the Australians southern environments where it is found. As a result it has a non discriminating diet, hunting down crickets, insects, slugs and even smaller frogs. It is on the vulnerable list of species Australia wide, but in New South Wales, one of the States of Australia where it is mostly found, it is on the endangered list. The reason seems to be simply urbanisation. Since just like people in our larger population centres, the frog enjoys the cooler but temperate climates of the coast. But there seems to be more to the reduction of the species habitat which once extended up to 50 or 100 kilometres west from the coastal regions of southeastern Australia. Now hugging the coast, it is unclear why it has lost this habitat since intense urbanisation is not a feature of the areas the frog has left behind.